"I think it's just a matter of that we used everything today," Burnett said. "I don't know if it's the catcher, but we used curveballs and fastballs in good counts. They had no idea what was coming, and that's huge. If I'd miss with a hook, he'd call another one. We didn't stay in a pattern." The speaker is A.J. Burnett and he is speaking about Francisco Cervelli, the 23-year old rookie catcher for the Yankees. And here it is: I think Francisco Cervelli should begin taking over the catching duties for the Yankees. OK, I'm putting Jorge Posada out to pasture....yet. But the time is coming. He is 37 years old, which is positively Jurassic by catching standards. And to put it mildly, his best days as a catcher and game caller might be behind him. If the above sentence from Burnett is any indication of how the pitching staff feels, then maybe Posada should spend more time at the DH position than at the catching position. OK, here are some stats. Opposing hitters are hitting .255 off of Yankee pitchers when Cervelli catches: They are hitting .285 off of the pitchers when Posada catches. When Cervelli catches, pitchers have a 2.26 SO/BB ratio; for Posada it's 1.42. Opposing batters have an OPS of .755 when Cervelli catches; .841 when Posada catches. And let's see if Burnett's enthusiasm for Cervelli is warranted. Burnett has pitched 13 games in a Yankee uniform so far; In the 4 games Burnett pitched to Jose Molina, opposing hitters hit .211; the 1 game Kevin Cash caught, it was .245; in the one game Cervelli caught, it was .174; and in the 4 games Jorge Posada caught, hitters hit a whopping .330 off of Burnett. And the truth is, Posada was never the best game-caller; he was always a "hitting catcher." That's not a knock—he wasn't a bad catcher...he just wasn't the best game caller. He was never a Varitek or Charles Johnson type. And right now—who knows about September?—right now, you're not missing much when Cervelli is in there. Posada definitely has the power advantage over Cervelli, but Cervelli is batting .298 to Posada's .288, which is not bad. And frankly, the Yankees don't need the home runs right now—they lead the league with 102 home runs....by 10. And defensively, you gain by having Cervelli back there. His fielding percentage is higher (.993 to .986) and has a better caught stealing percentage than Posada (38% to 32%). Of course, this is overstating it a bit. But not as much as you would think. 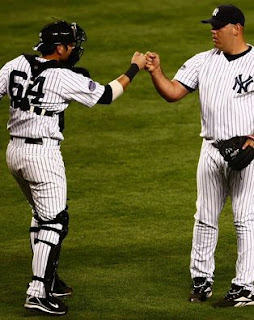 The Yankees went out and spent the national debt on the front end of a pitching rotation. Why would you then put them in a position not to succeed? To not put them in the best position to pitch well? And Posada could still do what he does best—hit. He's still a potent pitch-hitter and a home run threat every time at the plate. At 37, however....it might be time to start thinking of slowing him down a little. It's just that this year—when the Yankee rotation is completely overhauled; when we have two new pitchers in Burnett and Sabathia (by the way, the stats holds true for Sabathia; opposing hitters hit .256 in the 5 games Posada called; a freakish .190 in the 6 games Cervelli was catching. ), 2 young pitchers in Chamberlain and Hughes, and a pitcher struggling to return to form in Wang—what the Yankees need more than ever, is a catcher who is going to call the best possible game so that our staff feels comfortable and produces. And if Burnett is any indication, the staff feels more comfortable with Cervelli. 17 games started is still a small sampling and Burnett's opinion is just that, his opinion. I wonder if any of the other starters feel the same way. I don't know if his stats in the minors suggest he will hit at the major league level, maybe he is a .250 - .270 hitter down the road? Is that good enough, and is the defense/calling a game that much better? I agree. It is early for Cervelli to be the everyday catcher. but I think he should catch more. And Matsui....well his knees are shot. He couldn't run a bath, much less cover Death Valley in Yankee Stadium. I'd put Posada as a DH, with some catching duties, Matsui can play when Posada is catching, and have Cervelli start to catch a little more. Just wanted to give a shout out to New york Baseball Digest, who picked up this article. It's a great site, so bookmark it. Thanks guys. Is there a worse statistic on earth than catchers' fielding percentage?